Or will do anyway according to a recent report. 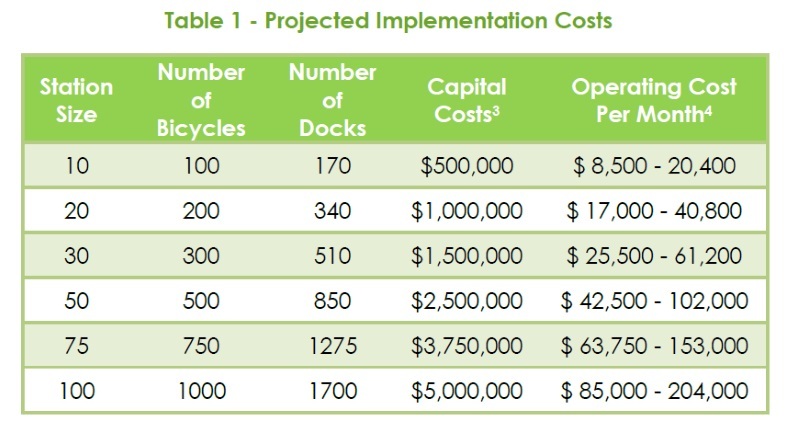 I just went through most of the recently released 2014 Raleigh Bike Share Feasibility Study. 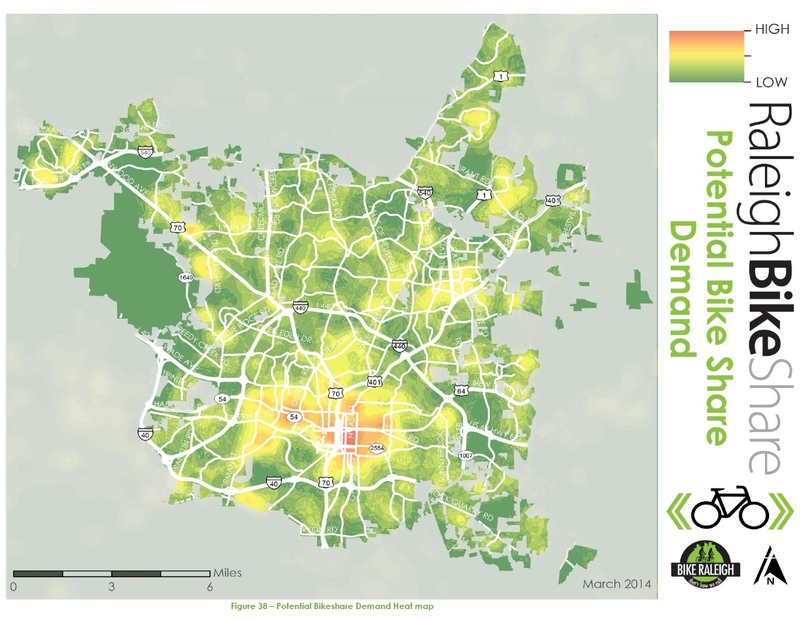 The conclusion of the study finds that a bike share system in Raleigh is feasible. You can get the study here (pdf) or see it and a lot of other Bike Raleigh information at BikeRaleigh.org. I decided to go through the study and take some notes. Also mentioned as obstacles are a “difficult topography” and “existing development patterns” that promote low population and employment densities outside of downtown. The first round of cost estimates are mentioned as well. From the report, here’s a table showing approximate startup and operating costs based on national averages. The study is divided into nine sections that start by introducing bike share, what it is and how it has been implemented in other cities, all the way to demand analysis in Raleigh and a final recommendation. A bike share system can help a community attract and retain residents. Many communities have used bike share systems as an added effort to help (re)vitalize and reactivate their downtown area(s). In addition, it provides a new and different way for tourists to see a city, helping attract more tourists and their spending power to communities. I won’t go over the basics and benefits of a bike share system in this post. Instead, I’ll recommend checking out the study or reading a June 2013 blog post about my visit to San Antonio and using their bike share system. The study starts by taking a look at Raleigh and some of the community features like demographics, physical makeup, and current infrastructure. Our temperate weather is always listed as a plus. Another plus are some generally flat areas around the core downtown. That’s not to say there aren’t some hills out there. I know Glenwood South is on quite a slant when cycling up and down it. 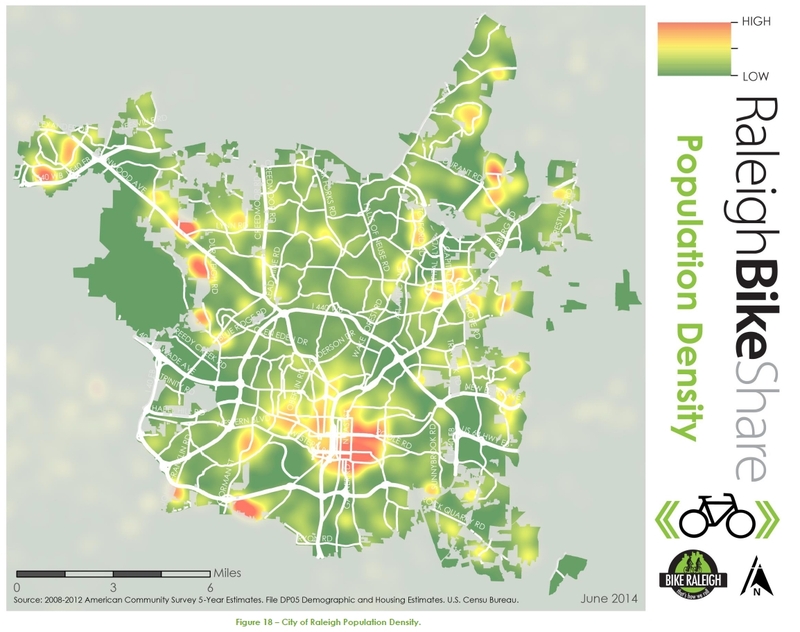 The City of Raleigh is the second most populous city in the state with approximately 423,000 people living in the city – a density of around 2,800 people per square mile, which is higher than all of the other southeastern bike share cities. That’s a pretty powerful statistic right there. Here is the comparison between us and other southeastern bike share cities. The study shows that the population and employment density is most clustered in and around downtown. There are a few pockets of higher density residential in southwest and north Raleigh but downtown really commands the most attention. See the figure below for a heat map of population density in Raleigh. Analysis was also done on low-income and minority communities. There is a significant overlap between feasible areas for bike share and locations of these communities. This presents an opportunity to provide a low-cost transit option to these residents. Here’s probably the biggest challenge and detractor to the feasibility of a bike share system in Raleigh. 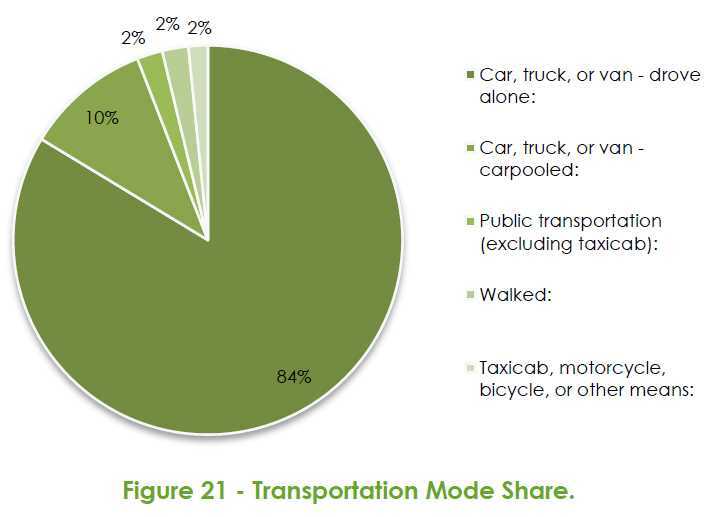 Raleigh is still a predominately auto-oriented city – single occupancy vehicle use represents 79-percent of all commuting trips (See Figure 21).98 Parking costs have traditionally also encouraged vehicle travel, even for short trips. The quote says 79% while the pie chart shows 84%. Unless I’m missing something that might be a typo in the study. Either way, both numbers are pretty high and significantly show Raleigh’s dependency on SOVs. The only area in the city with a significant amount of proximity to transit, mass transit specifically like Capital Area Transit (CAT), is in downtown. The study points this out as a challenge but lists an opportunity to use bike share to bridge gaps between activity centers that are poorly served by buses. I think this is the biggest challenge by far for a successful implementation of bike share in Raleigh. 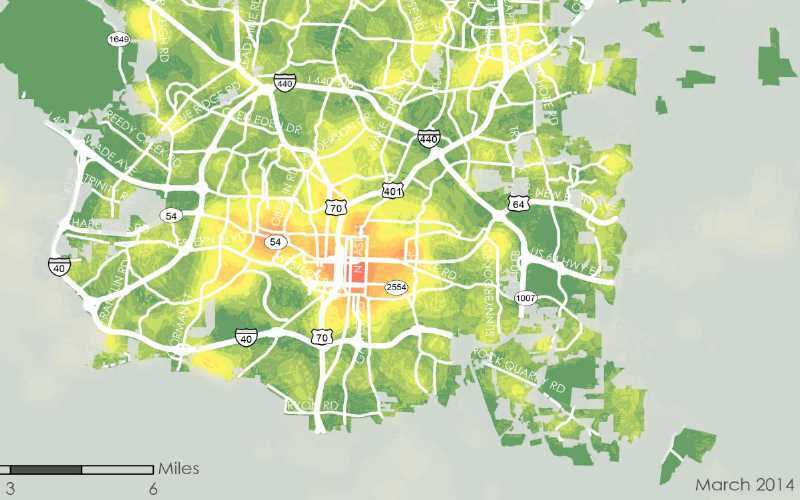 However, if you look at the overlap between the areas where bike share is feasible, mainly downtown, and the fact that bike facilities are spread across the city, this leaves much fewer miles to be used within a possible system. Here’s a point for more discussion. Most bike facilities are actually outside of downtown so to say that bike share can only happen near bike facilities doesn’t quite tell the whole story in my opinion. Downtown streets are naturally friendlier to bicycles so therefore are more fit for bike share. The study points out that there are much less bicycle facilities in downtown as a detriment to a bike share system and I think that could be argued against. Complicated indeed. An included flow-chart shows some situations having to go through seven layers of permitting. 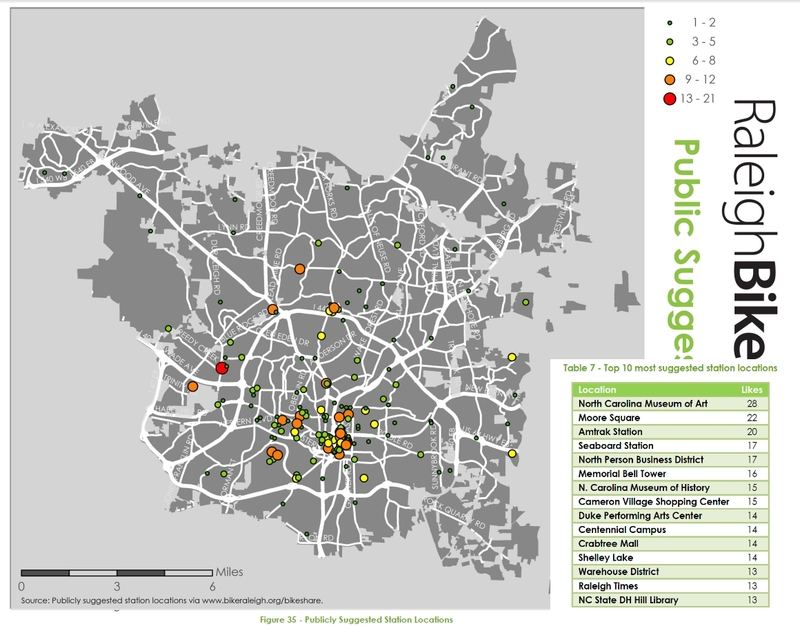 To gather more information, an online crowdsourcing map was built so that people could suggest station locations and provide comments. Here’s a map of the 151 stations that were received including a table of the top 10. The study goes on to explain its methodology behind the recommendations and results as well differences between the types of bike share systems that are out there. Below is a potential bike share heat map as well as a list with final conclusions and recommendations. All I know is, if Fort Lauderdale has a bike sharing program, Raleigh definitely deserves one. There was a news article that came out in April about people using the bikes (not renting them) to exercise. The secret…pedaling backwards while it’s still locked in the station. Ft. Lauderdale’s system is not South Florida’s successful bikeshare program. That honor belongs to Miami Beach. Its system is much denser and more highly utilized than the one in Ft. Lauderdale. I use it all time and it’s awesome. Thanks so much for sharing this information Leo!!!! Thanks for summarizing and consolidating the findings from the study. I hope that the bike share program is implemented in Raleigh soon! I think the most shocking thing I’ve read today is that Spartanburg has a bike share program. Agree with Matt Gray. I had to read it twice. Anybody who has been to Spartanburg would be shocked by this. Savannah was left off that list. I don’t think they have an extensive network but they do have bike share stations. It may not matter. The moronic GOP in the NC legislature is trying to push through a bill that forces cities to ‘choose’ between tax raises for education OR transit. 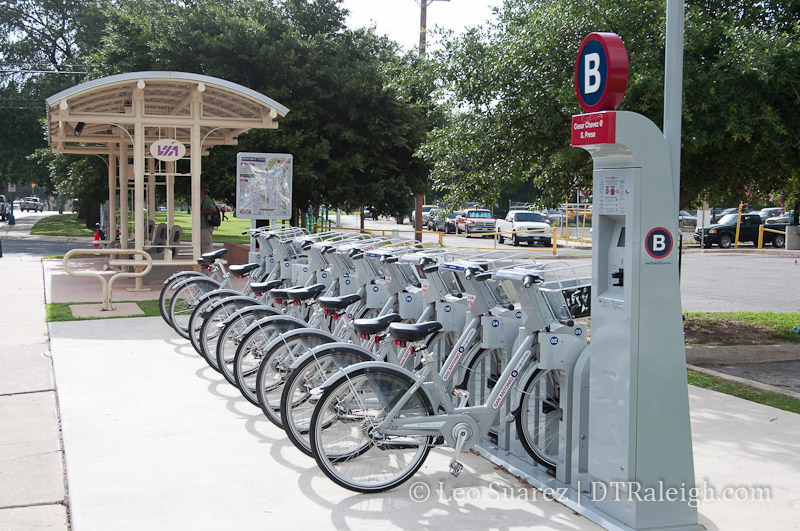 Bikeshare would be great for Raleigh, with Downtown, NC State and the Neuse River Trail being good places to start. The same can be said for the American Tobacco Trail and other campuses. Uncle Jesse. It’s easy to see what is happening. Pit progressives against each other. It’s a simple divide and conquer strategy that works often enough for it to be used again and again and again. Survival instincts take over more times than not and people throw their friends under the bus. This way the real evil doers don’t have to take the blame. Couldn’t people just steal them and then sell them off for like 40 dollars or something? Okay so not supporting bike share program equals evildoer. Gotcha. Too much Mt. Dew at 2:00 am? If you read the other comments, you will see that the vote forces citizens to choose between education and transit issues in general. Knowing that citizens will almost always vote for education first, they wipe their hands clean of killing transit opportunities. Of course, citizens are not being allowed to choose both. In general and back to topic, these systems only work where the stations are provided densely in close proximity to each other. The reason why Miami Beach’s system works is that there are stations nearly everywhere in SouthBeach and that its convenience allows users to grab one easily where they are likely to find themselves. What worries me about the destinations that people chose as their top picks is that they are way too scattered for an initial rollout. Frankly speaking, the NCMoA and Crabtree should be off the table for now. The city needs to concentrate on the core of Raleigh first. I can see moving a mile east or a mile west of DT but not much further or the system will find itself underutilized. Based on my experience using a successful system, the initial launch in Raleigh should be as compact and robust as possible to encourage and enable its use. All the DT districts should be serviced as should NC State/St Mary’s (Hillsborough St.), St. Augustine’s, Cameron Village, Chavis Park and Pullen Park. Shaw and Peace are already DT proper so they’re covered. Once the system has its footing, it can then branch out to other adjacent areas such as Five Points, Centennial Campus, etc. Particular attention should be paid to nodes of high density housing where many users can be captured in a single location. An example of this would be Tucker Street between Boylan and St. Mary’s where hundreds of urban apartments are located with many hundreds more within a block or two.